THE HAGUE, The Netherlands, June 17, 2010 (ENS) – One-third of the critical wetlands that migratory waterbirds need when traveling between Africa, the Middle East, Europe and Central Asia are entirely unprotected, according to the first survey using a new online information tool. 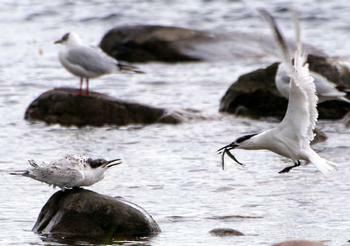 As a result, 42 percent of these waterbird species are in decline, bird experts warn. The online tool was unveiled Monday at an International Waterbird Conservation Symposium taking place in The Hague to mark the 15th anniversary of the African-Eurasian Migratory Waterbird Agreement, AEWA. 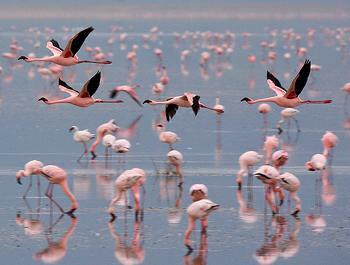 The international wildlife treaty aims to conserve migratory waterbirds which use the African-Eurasian Flyway. “The Critical Site Network Tool will provide an unprecedented level of access to information for all waterbird species covered by the African-Eurasian Migratory Waterbird Agreement,” said AWEA Executive Secretary Bert Lenten. The CSN tool provides comprehensive information on 294 waterbird species from 3,020 sites. Click here to use the new tool. More than 200 experts from 100 countries in the African-Eurasian region collaborated to develop the CSN Tool. Wetlands International, BirdLife International and the UNEP World Conservation Monitoring Centre organized the collaboration within the framework of the Wings Over Wetlands Project, the largest international waterbird and wetland conservation initiative ever undertaken in the African-Eurasian region. The tool was partly funded by the Global Environment Facility, an international environment financing organization, and by the German government. Marco Lambertini, chief executive of BirdLife International, said the CSN tool identifies priority sites for the protection of migratory waterbirds and highlights knowledge gaps, revealing that many stop-over and non-breeding localities are still not well known. “Only by combining adequate knowledge, targeted action, appropriate funding and local capacity on the ground will we be able to make a difference for migratory species,” said Lambertini. Migratory waterbirds, such as waders, terns and geese, need an unbroken chain of wetlands to complete their annual life cycles, but they are threatened by expanding aquaculture, agriculture and energy developments. The bird experts say the new tool shows how policies within the agricultural, water management and energy sectors influence biodiversity issues. “There is tremendous potential for the CSN Tool to benefit decision-making in these areas as well,” said Ward Hagemeijer, Head of Biodiversity at Wetlands International. In a related development, new conservation plans for the Siberian crane have been endorsed to save the species from extinction, UNEP reported during a meeting of the Convention on the Conservation of Migratory Species of Wild Animals in Bonn on Monday. 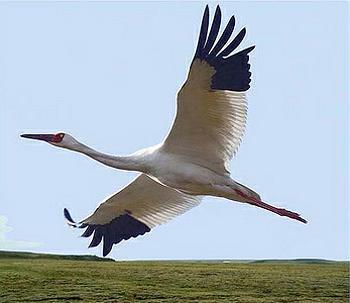 With only 3,000 to 3,500 left in the wild, the Siberian crane, Grus leucogeranus, is listed as Critically Endangered. During their annual migration, Siberian cranes travel 5,000 kilometers (3,000 miles) from their breeding grounds in western Siberia and Yakutia to wintering sites in southern China and Iran. Along these flyways, they overcome obstacles such as high mountains and vast deserts. Major threats such as hunting in western and central Asia and the drainage of critical wetlands in east Asia increase their risk. This year, the GEF-funded $10.3 million Siberian Crane Wetland Project has succeeded in safeguarding a network of 16 critical wetlands for waterbirds in China, Iran, Kazakhstan and Russia, while securing water flows to sustain these wetland ecosystems. Millions of people in the Eurasian region will also benefit from the supply of clean water purified by its passage through these wetlands. An expansion of the critical site network established for the Siberian Crane Wetland Project now will be applied to hot spots in 11 countries that are signatories to the Convention on the Conservation of Migratory Species of Wild Animals, CMS. The same wetlands benefit local residents by providing clean water and opportunities for fishing, agriculture, recreation and tourism.